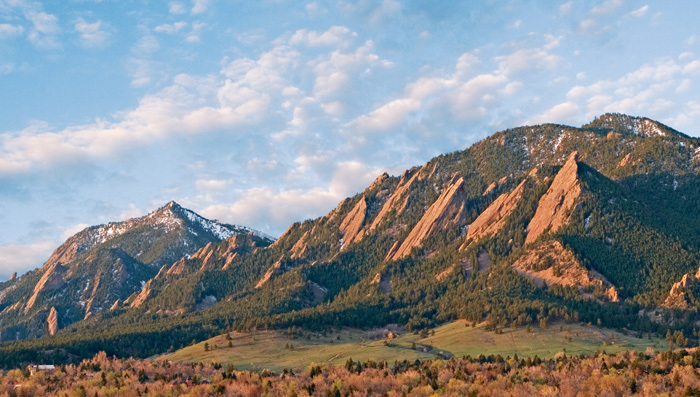 Every season offers a unique view of the Boulder Flatirons. Located at the base of the Flatiron Mountains, Chautauqua Park offers paradise for hikers, birdwatchers and photographers. The massive Flatirons are unique sandstone formations cropping out from the base of the Rocky Mountains and can be seen from almost every vantage point in Boulder. Chautauqua Park is also home to the Chautauqua Summer Festival and the Colorado Music Festival. Photo © copyright by Mike Barton.